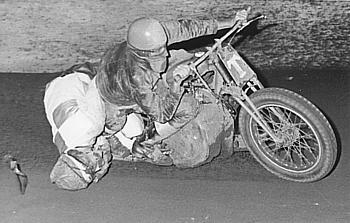 We'll open the Sidecar page with some great colour shots by photographer Gary Reid. 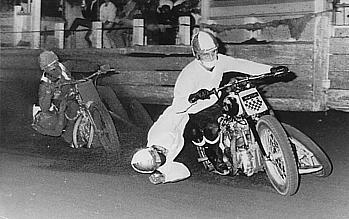 Gary was an assistant to Bill Meyer and photographed at the Royale. Thanks Gary for the use of these photos. 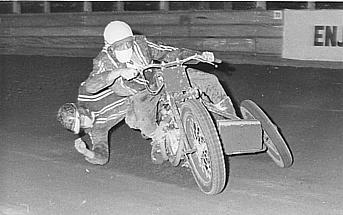 B/W photos courtesy of Larry Taylor. 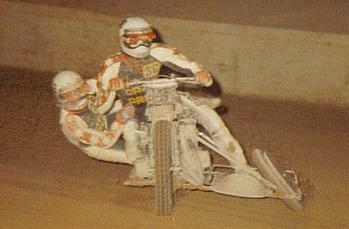 Garry Keene and passenger, Garry Martz. 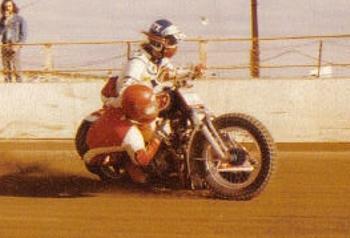 Paul Vercoe and passenger Kevin Freeman. 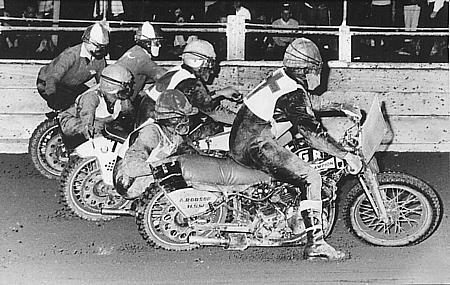 Nik Sardalich, Phil McCurtayne, Pete McCurtayne and Warren Sullivan ( in chair ) as passenger with the Bert Bayliss Triumph. 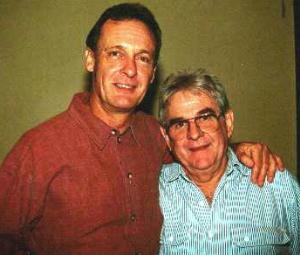 Phil McCurtayne and Doug Tyerman in 2001. Garry Innes and passenger ! Garry where DO you get passengers like that ? 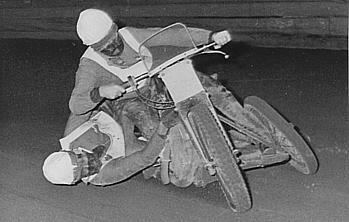 Noel Edwards with Brian Borrowdale as passenger. 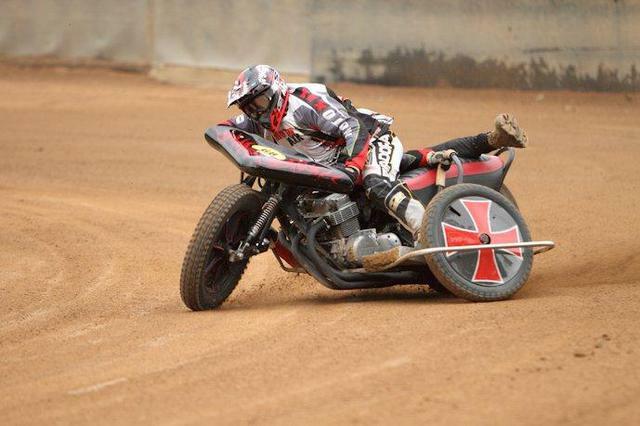 Photo supplied by Noel's son. 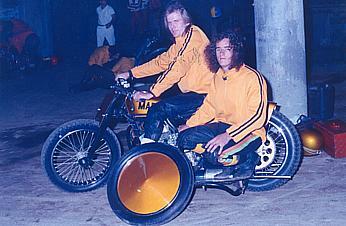 Doug Tyerman and Graham Young at the Royale. 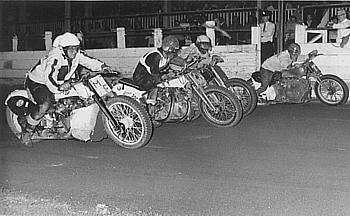 From the inside: Maurie Ford, Eric Davies, Graham Young and Doug Tyerman with John 'Tiny' Maley as passenger.. Scratch race at the Royale. John Dunne. John lost his life at the Royale on 24.10.1970. What a fabulous site ! 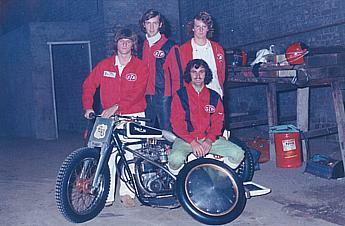 3 of the magic big HRDs and 3 great rider / passenger combinations. From inside Doug Robson, Graham Young and Bob Levy. Don't they look mean ! 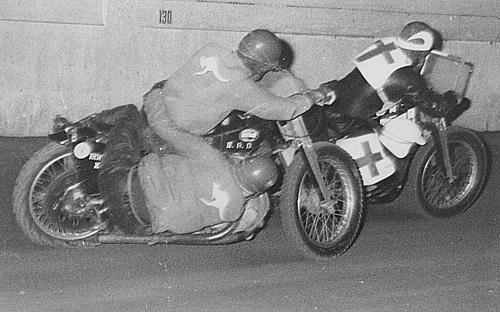 Col Denny leads Graham Young. 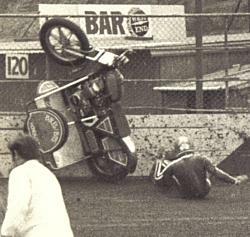 Could Denny's passenger get any lower ? John Dunne with Chicka Green in the chair and Bob Levy and Col Lewis. 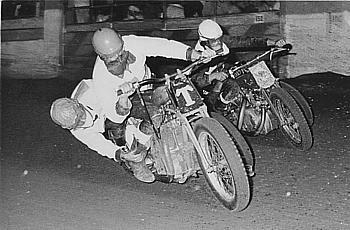 Another great Larry Taylor photo of Doug Tyerman and passenger. 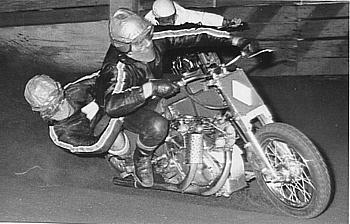 Ted Preston. 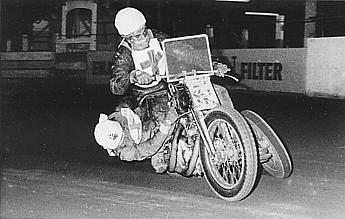 Ted lost his life at the Royale on the 5.2.1966. 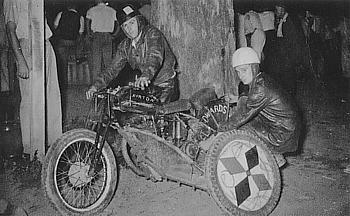 Peter Speerin and Jack Young, left, on the Jim Davies Twin J.A.P engined outfit ( 2 separate J.A.P. 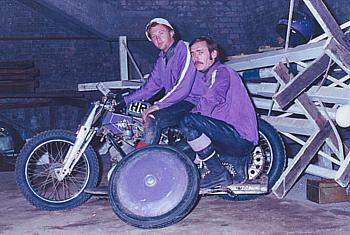 engines coupled together ), 1 in the chair, and the great Jim Davies with Johnny Hall on the right. 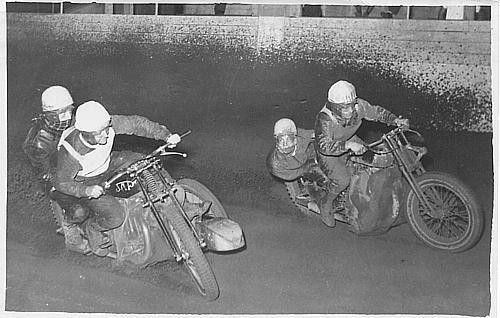 The photo was taken on the Pit turn at the Sydney Showground Speedway in the mid 1950s and Peter and Jim later took these two bikes to England for demonstration rides where Peter came off and was injured. 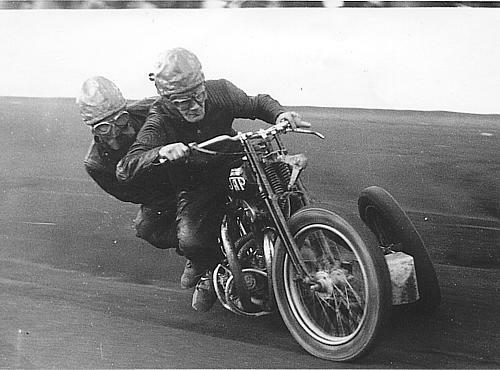 Peter & Jim never wore gloves and wore only the single pair of Gas goggles when racing. 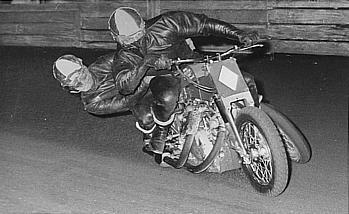 ............but this has to be the best study of a Sidecarist in action .....and it had to be taken by a Pomme !.. 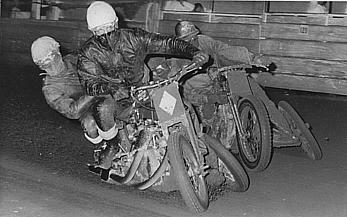 English photographer Wright Wood of Lancashire took this superb study of multi Australian Sidecar champion Jim Davies and passenger on the big J.A.P. 880 when Jim took the outfits to England in the mid 1950s. 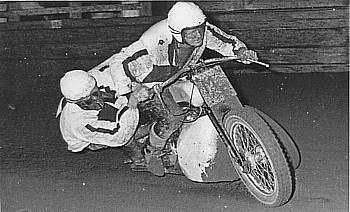 Tony Williams and Ern Gallagher. 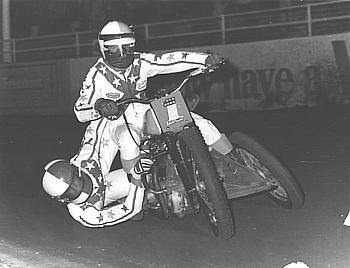 Tony and Ern in action at the Royale in the mid 1970s on an ex Doug Tyerman built Triumph outfit. 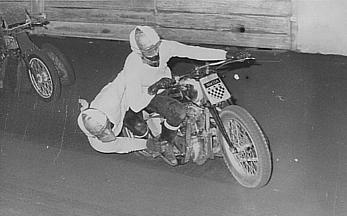 Ken Lyon & Arthur Omond at Renmark Speedway . 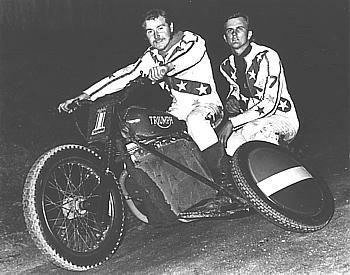 S.A.
Ken Lyon & Graham Jacobs at Rowley Park . 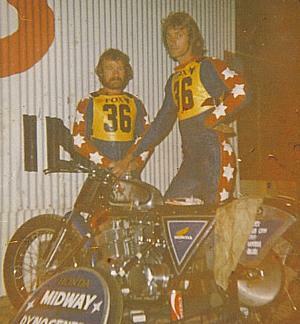 S.A.
Ken Lyon & John McNorton at Murray Bridge. 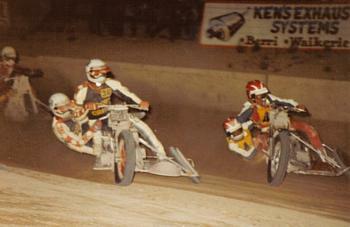 S.A.
Ken Lyon & Arthur Omond inside Ken L'Anson & Kerrie Perks.Renmark S.A.
Riverland Title L'Anson 1st. Lyon 2nd. 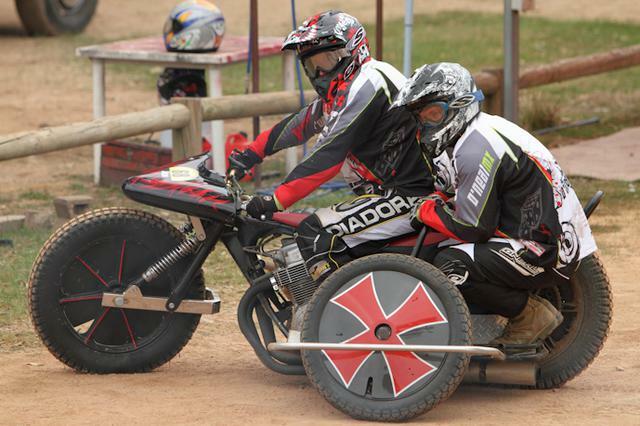 Lyon and Jacobs have an "off" at Rowley Park S.A., Lyon out of picture. Tony Williams in later years.